Maybe you don’t realize but just as your clothes and body language, your office cubicle decor says a lot about your personality. Since you spend around 40 hours a week in your cubicle, it is like your second home and therefore, it reflects your lifestyle and character. Believe it or not, your coworkers and bosses are looking at your cubicle and forming ideas about you in their minds. What do you think they think about you when they see your cubicle? Look at the workspace styles below and figure out your personality type. 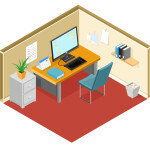 The Blank and Bare Cubicle: A blank and bare cubicle means that you are either new in the office or not planning to stick around for a long time. If you are there for long enough but still your cubicle has no personal touches, your coworkers may also think that you are a boring person. However, some people are minimalists in their approach and don’t like to keep much stuff around unless it is functional to them. Thus, a cubicle with only essential office stuff may also indicate that you are a minimalist when it comes to décor. Moreover, some people like to separate their professional life from their business life and for this reason; they don’t like to add personal touches to their office space. Fun Cubicle: If you have stuffed animals, movie posters, action figures in your cubicle, then you probably want to show your entertaining and fun personality to your coworkers. You may want to be perceived as the life of the party but there is also a risk that your coworkers may think you are too laid back and don’t take work seriously. Moreover, to have a workspace like Toys ‘R’ Us is very distracting. You need to find the right balance in order to give both a professional and a fun image to your coworkers. The Post-It Notes Cubicle: In this type of style, generally there are color coded post-it notes all around the cubicle. This means you are either a workaholic or very overwhelmed with your job. These post-its show others that you have a lot going on your plate or work in a chaotic fashion. The downside is that your coworkers may not want to approach you thinking they may disturb you, since you seem pretty busy. Therefore, socially you may be left out in the office. In this case, adding a personal touch such as a photo or a memorabilia from your last vacation will show you as a socially more approachable person. Also, photos and memorabilia are good conversation starters in the office.